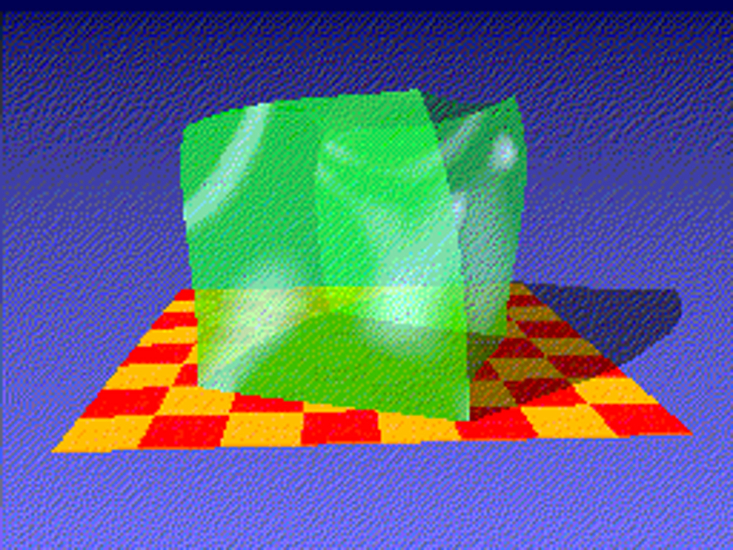 This program exports an ISIS cube to one of several popular standard image formats. 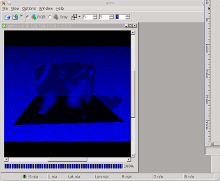 The current supported formats are BMP, JPEG, JP2, PNG, and TIFF. 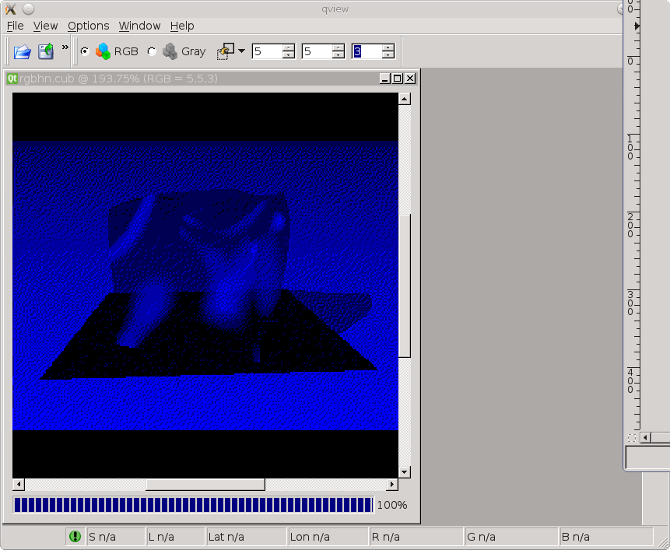 This program uses TrollTech's version of the Qt Library to export BMP and JPEG formatted output images. For these format types, due to limitations of Qt, the input file size must not exceed 2 gigabytes and the only valid output bit type is 8-bit. The JPEG2000 (JP2) and TIFF formats do not depend on the Qt library. These formats do not have the 2 GB limitation for input files and the output bit type may be 8-bit, U16-bit or S16-bit. For these formats, the writing routines output are streamed lines from the cube, and little of the image is held in memory at any one time, therefore increasing the processing speed to convert the file. It is recommended that large images are exported to JP2 or TIFF format. For some output image types, users may specify a value for the level of compression represented as a percentage using the QUALITY parameter. The default is no compression (i.e. QUALITY = 100%). For the TIFF format a compression algorithm can be selected. Each of the input cube parameters (FROM, ALPHA, RED, GREEN, and BLUE) requires a single band from an ISIS cube. If a cube contains multiple bands, the user must specify a single band of the input image. To do this, the user must append a plus sign and the band number to be used to the input file name. For example, inputFile.cub+4 indicates that the 4th band in the cube will be used. No band needs to be specified if the cube only has a single band. In addition, if the cube has Mapping labels, the program will produce a world file for use in Arc and/or other GIS packages. The file will have an extension that uses the first and last letters for the image extension and a "w". For example, .tif produces a world file extension of .tfw. To ensure acceptable contrast in the output file, the user may select from three stretch options: linear, piecewise-linear, or manual. Special pixels such as Low Saturation values and Nulls are set to black and High Saturation values are set to white. See the BITTYPE parameter documentation for more information about which output pixel values are assigned for particular input DNs of the various bit types. Jacob Danton 2006-02-06 Added two new modes (rgb and argb) and updated the appTest. Jacob Danton 2006-05-22 Added seperate MINIMUM and MAXIMUM parameters for all channels. Steven Lambright 2007-07-10 Modified to give an error if write fails. Memory leak fixed. Steven Koechle 2007-08-22 Added a check to see that raw image data will be less than 4GB. Throw exception if it is too big. Christopher Austin 2008-11-04 Fixed checkDataSize() since Qimage has a maximum size of 2 GB, not 4GB. Added some QT error catching. Janet Barrett 2010-01-27 Added support for JPEG2000 files. Travis Addair 2012-04-03 Added support for exporting cubes greater than 2GB to TIFFs. Steven Lambright 2012-08-28 Fixed some problems with the big tiff exports that caused corrupt outputs. The 2GB limitation should be removed completely now. References #579. Jeannie Backer 2013-06-05 Fixed bug where alpha channel was not being utilized for ARGB option. Fixed bug that mapped Nulls as the min value for TIFF and JP2 formats. Changed ImageExporter calls to new method names, where needed. Added test for ARGB parameter. Added xml example. Added appTests to improve coverage for isis2std program and the ImageExporter and its derived classes. Fixes #1380. Kaitlyn Lee 2018-02-08 Removed the option to export as a GIF because Qt does not support GIF exports. Fixes #1667. Use this parameter to select the filename and band to export. For example, file.cub+5 will select band 5. Use this parameter to specify the name of the output file. This parameter specifies the image mode. If GRAYSCALE, a single one-band cube is used. If RGB, three one-band cubes are used. If ARGB, four one-band cubes are used. GRAYSCALE Output has one channel (gray scaled). If this option is chosen, the output image will have a single channel and the user will be required to specify the parameter FROM. RGB Output has three channels (red, green, and blue). If this option is chosen, the output image will have three channels and the user will be required to specify the parameters RED, GREEN, and BLUE. ARGB Output has four channels (alpha, red, green, and blue). If this option is chosen, the output image will have four channels and the user will be required to specify the parameters ALPHA, RED, GREEN, and BLUE. This parameter is used to select the output format. It can be one of PNG, BMP, JPEG, TIF, or JP2. Note that not all formats may be available. It will depend on your installation of the Qt libraries. PNG Output image will be PNG The output image is in PNG (Portable Network Graphics) format. The default extension for this format is "png." BMP Output image will be BMP The output image is in BMP (Bit Mapped Graphics) format. The default extension for this format is "bmp." TIFF Output image will be TIFF The output image is in TIFF (Tagged Image Files Format) format. The default extension for this format is "tif." JPEG Output image will be JPEG The output image is in JPEG (Joint Photographic Experts Group) format. The default extension for this format is "jpg." JP2 Output image will be JPEG2000 The output image is in JPEG2000 (Joint Photographic Experts Group 2000) format. The default extension for this format is "jp2." This parameter allows the user to specify level of quality (compression) for the output image. Some output image types may not utilize this parameter. The range is from 100 (no compression and highest quality) to 0 (highest compression and reduced quality). A value of -1 can be given to use the default settings. 8BIT Output is 8 bit unsigned integer data Pixels values are within 8-bit unsigned integer data range from 0 to 255. U16BIT Output is 16 bit unsigned integer data Pixel values are within the 16-bit unsigned integer data range from 0 to 65535. This option is not available for some output formats. S16BIT Output is 16 bit signed integer data Pixel values are in 16-bit signed integer data range -32768 to 32767. This option is not available for some output formats. The compression algorithm used to compress an output TIFF format image. Only used if the format is set to TIFF. The default is no compression. PACKBITS is the most widely supported compression algorithm for the TIFF format. NONE Use no compression Use no compression on the output TIFF image. PACKBITS Use PackBits compression Use PackBits compression on the output TIFF format image. PackBits is also known as Macintosh RLE. This compression algorithm should be supported by all TIFF readers that conform to the Baseline TIFF specification. LZW Use LZW compression Use Lempel-Ziv-Welch(LZW) compression on the output TIFF format image. DEFLATE Use Deflate compression Use Deflate compression on the output TIFF format image. Note: This uses the official version of Deflate for TIFF images described in the TIFF Specification Supplement 2. Other versions of deflate for TIFF images are considered obsolete. This parameter is used to select one of three ways to stretch (or map) output pixels. The are LINEAR, PIECEWISE, or MANUAL. LINEAR Linear stretch A minimum and maximum are automatically computed based on the statistics of the selected band. A histogram of the band is used to pick the minimum at 0.5% of the data and the maximum at 99.5% of the data. Input pixels less than or equal to the minimum are stretched to black while pixels greater than or equal to the maximum are stretched to white. A linear mapping occurs between the minimum and maximum. PIECEWISE Piecewise-linear stretch This option is similar to the LINEAR option. A minimum and maximum are automatically computed. Additionally, the median is computed and it is mapped to the middle gray value (halfway between white and black). Therefore, it is a piecewise-linear stretch with input pixels mapped linearly between either 1) the minimum/median or 2) the median/maximum. This option is useful for contrast stretching cubes with skewed histograms to ensure a balanced contrast. Example of red/green/blue output of isis2std program. This example creates an output TIFF format file from 3 bands of an ISIS cube, designated red, green, and blue using a linear stretch and 8-bit output type. A histogram is created from the input values. Using this histogram, we determine the minimum value to be any DN in the bottom 0.2% of the data. These DNs will be set to black in the output. Similarly, the maximum value is any DN in the top 99.8% of the data and these DNs will be set to white. Command line for this example. This image show the graphical user interface for this program. The first band of the input cube, shown in red. The input cube band to be exported as the red channel in the output image. The first band of the input cube, shown in green. 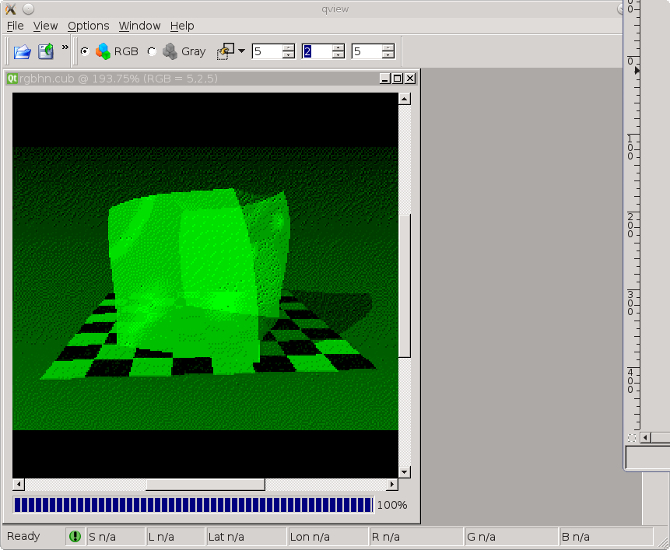 The input cube band to be exported as the green channel in the output image. The input cube band to be exported as the blue channel in the output image. The output text world file for this image. The 8-bit output image, in TIFF format, created using the input red, green, and blue channels.